Stripe rust and yield differences in non-sprayed and fungicide-sprayed plots of winter wheat varieties are shown in Table 1 and of spring wheat varieties in Table 2. Of the 24 winter wheat varieties tested including susceptible check ‘PS 279’, 19 varieties (PS 279, Xerpha, Eltan, ORCF-102, Keldin, ARS-Crescent, SY 107, Puma, SY Ovation, Whetstone, UI Sparrow, Westbred 528, Jasper, Otto, Rosalyn, Skiles, Farnum, Legion, and Madsen) had significant differences in stripe rust severity (presented as rAUDPC) between the non-sprayed and sprayed treatments, but the percentages of severity reduction by fungicide application ranged widely from 3% (Madsen) to 88% (PS 279) (Table 1). 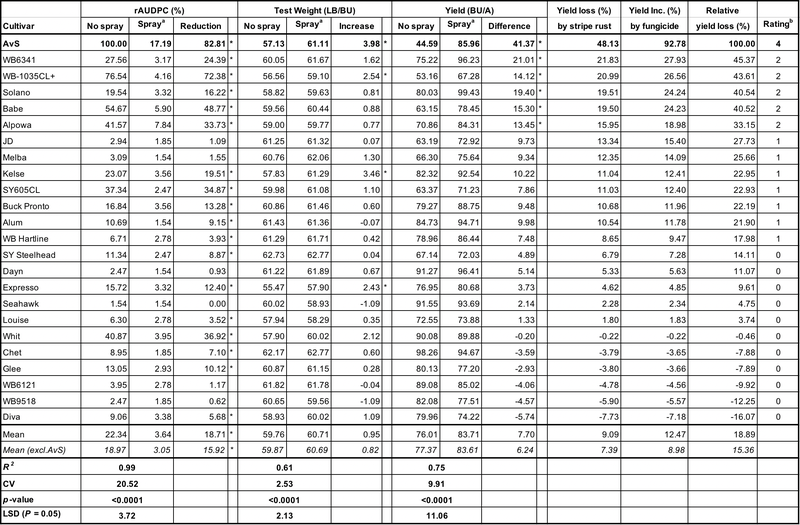 Ten varieties (PS 279, ORCF-102, Xerpha, Eltan, SY 107, Whetstone, Keldin, Cara, UI Sparrow, and Puma) had significant differences in grain test weight with increases from 1.4 lb/bu (Puma) to 11.3 lb/bu (PS 279). Fourteen varieties (PS 279, Xerpha, ORCF-102, Eltan, SY 107, Keldin, Whetstone, Otto, UI Sparrow, SY Ovation, Westbred 528, ARS-Crescent, Jasper, and LCS Jet) had significant differences in yield between the sprayed and non-sprayed plots. Stripe rust caused 75% yield loss on the susceptible check (PS 279) and from 0 to 49% yield losses at an average of 16% on commercially grown varieties. The 75% yield loss in the extreme severe epidemic category on the susceptible check was higher than the 40-60% yield loss in the severe epidemic category forecasted in the early March 2017. Fungicide application increased yield by 0 to 96% at an average of 10% on commercially grown varieties. Under the extreme severe level of stripe rust epidemic, 14 (Xerpha, ORCF-102, Eltan, SY 107, Keldin, Whetstone, Otto, UI Sparrow, SY Ovation, Westbred 528, ARS-Crescent, Norwest 553, LCS Jet, and Jasper) of the tested commercially grown winter wheat varieties needed fungicide application as they had significant yield losses and received fungicide application ratings 2 to 7. Three varieties (Puma, Rosalyn, and Skiles) received fungicide application rating 1, which might or might not need fungicide application. The remaining six varieties (Franum, Bruehl, Madsen, Cara, Bobtail, and Legion) with rating 0 did not need fungicide application. Similarly, of the 24 spring wheat varieties tested including susceptible check ‘AvS’, 18 had significant differences and 6 (JD, Melba, Dayn, Seahawk, WB6121, and WB9518) did not have significant differences in stripe rust severity (presented as rAUDPC) (Table 2). 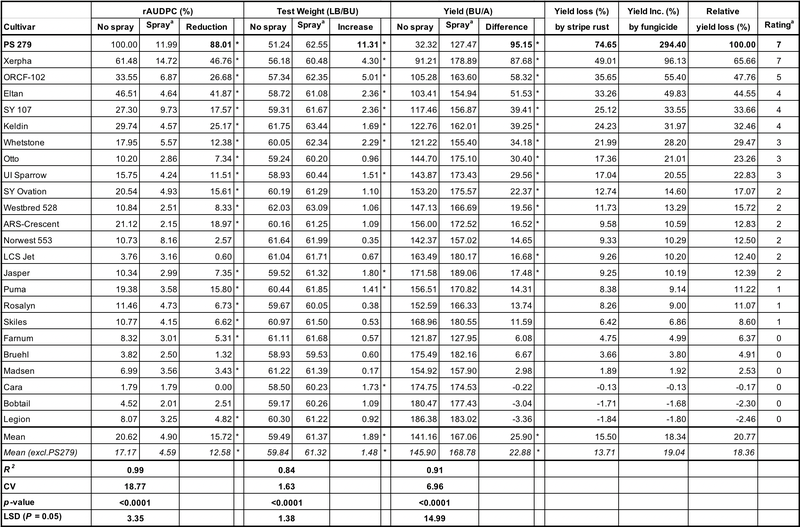 Only four varieties (AvS, Kelse, WB-1035CL+, and Expresso) had significant differences in grain test weight. Only six varieties (AvS, WB6341, WB-1035CL+, Solano, Babe, and Alpowa) had significant differences in grain yield. Stripe rust caused 48% yield loss on the susceptible check and from 0 to 22% yield losses at an average of 7% on commercial varieties. Fungicide application increased grain yields by 0 to 28% on commercial varieties at an average of 9%. The six varieties (AvS, WB6341, WB-1035CL+, Solano, Babe, and Alpowa) that had significantly different yield losses received fungicide application ratings 2 or 4. Seven varieties (JD, Melba, Kelse, SY605CL, Buck Pronto, Alum, and WB Hartline) received rating 1, which might or might not need fungicide application. The remaining eleven varieties (SY Steelhead, Dayn, Expresso, Seahawk, Louise, Whit, Chet, Glee, WB6121, WB9518, and Diva) received rating 0 and did not need fungicide application under the rust pressure in 2017. The data can be used to select stripe rust resistant varieties to plant and to determine if fungicide application is needed for a variety based on the relative yield loss and potential epidemic level. Based on the current forecasted epidemic level (6% yield loss on susceptible varieties) for 2018 (see below), fungicide application is generally unnecessary, unless different forecasts may be made in March or later. In 2017, a total of 23 fungicide treatments plus a non-treated check were tested for their effectiveness on both winter wheat and spring wheat in fields near Pullman, Washington under natural infection of stripe rust. In the winter wheat field, stripe rust started developing in early April when plants were at the early jointing stage (Feekes 4) and reached 5-15% by May 19 when the first application was done at Feekes 5 (tillering), 80- 90% at Feekes 10 (boot), and 100% severity at Feekes 10.5 (flowering) in the non-treated check plots (Table 3). All fungicide treatments of the first application significantly reduced rust severity compared to the nontreated check and the treatments without the first application at the boot stage (Feekes 10). All treatments significantly reduced rust severity compared to the non-treated check at the flowering (Feekes 10.5) and milk (Feekes 11.1) stages. The treatments with only the first application had similar rust severity to the non-treated check at the dough stage (Feekes 11.2). Overall, all of the fungicide treatments significantly reduced the rAUDPC (an overall measurement of disease using the multiple severity values) values compared non-treated check, with treatments 8-12, 18, 19, and 24 providing the best control (Table 3). Ten treatments (8-11, 18, 19, 21, 23, and 24) significantly increased test weight compared to the non-treated check. All treatments significantly increased grain yields compared with the non-treated check, and the increases ranged from 19 bushes (88%) to 54 bushes (242%). The highest yield was achieved by the treatment of Trivapro 9.4 fl oz/A at Feekes 5 and at 13.7 fl oz/A at Feekes 10. The spring wheat field was planted on May 11, much later than the normal planting date for the Palouse region due to the wet field condition. Stripe rust started developing in the field in the middle of June. About 1-5% rust severity was recorded in the plots on June 19 (Feekes 5). The first application of fungicides was done on June 23 (Feekes 5) and the second application was done on June 30 (Feekes 10). Rust severity reached 90- 100% in the non-treated check plots by the flowering stage (Feekes 10.5) (Table 4). All fungicide treatments significantly reduced rust severity at the flowering (Feekes 10.5) and soft dough (Feekes 11.2) stages compared to the non-treated check and overall relative AUDPC values. Twelve treatments (7-13, 16-19, and 24) provided the best control, and ten treatments (7, 8, 10-15, 18, and 24) significantly increased grain test weights compared to the non-treated check. All treatments significantly increased grain yield, and the increases ranged from 11 bushes (26%) to 33 bushes (80%) depending upon fungicide treatments. On November 7, 2017, we were checking winter wheat fields in Whitman, Lincoln, Adams, Grant, and Douglas counties in eastern Washington. We did not see any rust, indicating that the fall infection of winter wheat by the stripe rust pathogen was low. This was different from the high rust incidences observed in many fields in the same regions on November 8, 2016. However, the absence of visible rust in wheat fields before winter is normal for eastern Washington. Based on the weather conditions in November and December 2017, stripe rust in the 2018 wheat growth season will likely be in the low epidemic level range (0-20% yield loss). According to the forecast models based on the November and December weather conditions, highly susceptible winter wheat varieties would have 6% yield loss and currently grown varieties would have less than 3% yield loss. If this forecast is close to the real disease level, the early fungicide application at the time of herbicide application for winter wheat would not be necessary. Based on the past experience, the early prediction made in January is sometimes close to the real situation but is never better than the prediction in March based on the entire winter weather conditions. Therefore, we will make another prediction in early March. Table 1. Differences in stripe rust severity (as rAUDPC), test weight, and yield in non-sprayed and fungicide sprayed plots of winter wheat varieties testing under natural infection of the stripe rust pathogen near Pullman, Washington in 2017. * The difference between the non-sprayed check and fungicide spray plots is significant at P ≤ 0.05.
a Quilt Xcel at 14.0 fl. oz/A was sprayed at middle jointing stage (Feekes 6) on May 8 when the susceptible check PS 279 had 2-5% severity of stripe rust. b Varieties with a 0 rating does not need fungicide application, those with a rating of 1 may or may not need fungicide application, and those with a rating of 2 or higher needs fungicide application. 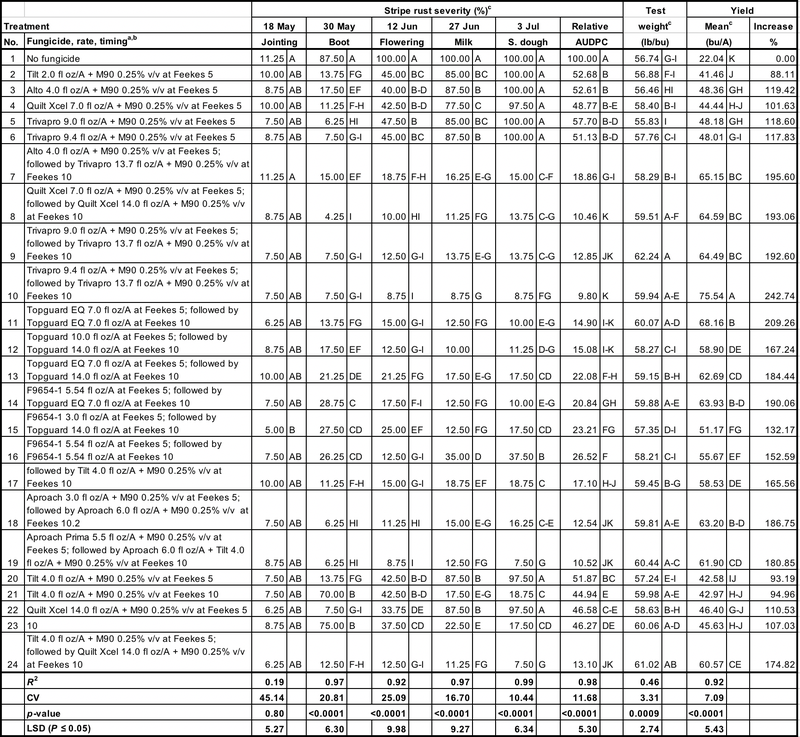 View Table 1 in pdf format (pdf). Table 2. Differences in stripe rust severity (as rAUDPC), test weight, and yield in non-sprayed and fungicide sprayed plots of spring wheat varieties tested under natural infection of the stripe rust pathogen near Pullman, Washington in 2017.
a Quilt Xcel at 14.0 fl. oz/A was applied at early jointing stage (Feekes 4-5) on June 19 when the plots did not have stripe rust. b Varieties with a 0 rating do not need fungicide application, those with a rating of 1 may or may not need fungicide application, and those with a rating of 2 or higher need application. View Table 2 in pdf format (pdf). Table 3. Stripe rust severities and relative area under the disease progress curve (AUDPC), test weight, and yield are susceptible winter wheat (‘PS 279’) field plots not sprayed (no fungicide) or sprayed with various fungicide treatments under natural infection of the stripe rust pathogen near Pullman, Washington in 2017.
a The application at Feekes 5 (early jointing) was done on May 19, and at Feekes 10 (boot) on June 2, 2017.
b The field was under natural infection of the wheat stripe rust pathogen. c Means sharing one or more letters are not significantly different at P = 0.05. 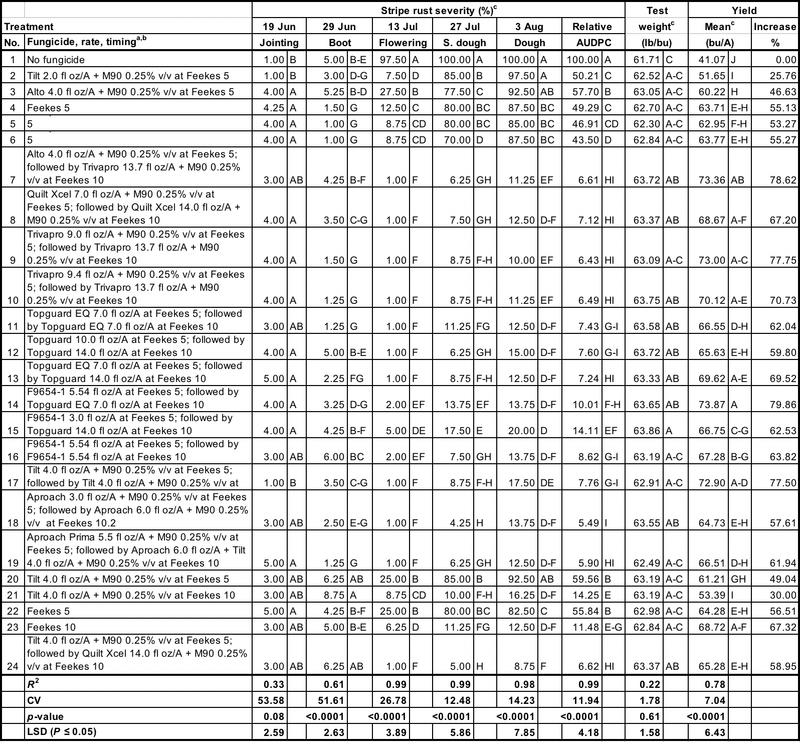 View Table 3 in pdf format (pdf). Table 4. Stripe rust severities and relative area under the disease progress curve (AUDPC), test weight, and yield in susceptible spring wheat (‘AvS’) field plots not sprayed (no fungicide) or spray with various fungicide treatments under natural infection of the stripe rust pathogen near Pullman, Washington in 2017.
a The application at Feekes 5 (early jointing) was done on June 23, and the Feekes 10 (boot) on June 30, 2017. View Table 4 in pdf format (pdf). For questions or comments, contact Xianming Chen by email at xianming@wsu.edu.